Today I’m going to share with you a bit about what family life looks like for me and why living intentionally to seek inspiration as a family is a real passion of mine. I know it’s a little move away from some of the chronic illness posts I write but it’s a really significant part of my life, made even more vital by the challenges I face as a chronically ill parent. I’ve always been a fairly positive person. I loved my job as an art teacher, it was a real privilege to work with children and teenagers to help them realise their creative potential. Encouraging others to believe in themselves, think creatively and become inspired by the world around them was a real joy. Although, due to my ill health, I no longer teach, I still retain my enthusiasm for inspiring others and seeking inspiration in my own life. Since my Multiple Sclerosis diagnosis 3 and a half years ago my positive disposition has been really put to the test! There have been more tough times than I’d like to dwell on and during the hardest moments I’ve endured, my family life has felt far from inspired. For a long time, day to day survival was all I could manage. A harsh reality but one which dramatically altered my perspective and made me realise that life is most definitely for living! Thankfully, although I still battle with fatigue and brain fog to varying extents every day, due to careful management of my illness, I’m able to enjoy more time with my son and be the parent I want to be. For me, at least, creating an inspired family life isn’t about striving for ‘perfection’. Quite the opposite in fact; I’d much rather celebrate all of our unique qualities! It’s more about living intentionally, by recognising what we value most and acting together, with purpose, to create a life which works for us. Finding our own path and doing what brings us the most joy. Exploring opportunities to play and learn creatively. Actively seeking inspiration from the world around us and placing a high value on meaningful experiences. Appreciating the little things as we love, support and celebrate each other. Simplifying life and taking the time to relax together. I soon realised that many of these aims I’d already been working towards; however, I’d never really fully acknowledged them before! Taking the time to properly identify what was most important to us and what I know would best serve our family is really helping us to live more intentionally. Now I know where I’d most like to direct my energies it’s easier to make more time for what truly matters…and to cut back on what really doesn’t too! Of course, having these values and intentions doesn’t mean that all of the ups and downs of chronic illness, endless daily chores and life admin magically disappear. I wish! It just means that we remember to leave room for what’s important to us too and when that’s difficult, we know we need to reassess our priorities and look for ways to create space in our busy and demanding lives. I’ve always had very personal ideas on what my ideal family life would look like and often felt that I didn’t always prioritise the same things as others. And that’s absolutely fine, I don’t believe that my way is the best way, or the only way, just the way which will make myself and my family happy. Since I was diagnosed with MS, it’s become even more crucial that we find our own path and discover what works best for us. I’ve quickly realised that trying to stick to a template which doesn’t suit my family and its individual needs doesn’t end well and is potentially harmful for everyone involved. Additionally, our son often displays autistic traits, although we’ve received no formal diagnosis to date. Again, this means approaching family life differently and in a way which will support and nurture him fully. I get so excited about creating opportunities to play and learn together as a family! As a creative person and ex-teacher inspiration comes quite naturally to me. I have so many ideas it’s sometimes hard to keep up with. Though realising my intentions isn’t always easy with a fluctuating illness, low-energy days and time-sapping demands aplenty! Focusing on playing and learning creatively whenever we get the opportunity enriches our lives so much it’s well worth the effort and commitment involved. And I don’t just mean making time to do arts and crafts together, although both are clearly awesome and pretty central to our inspired family living philosophy! 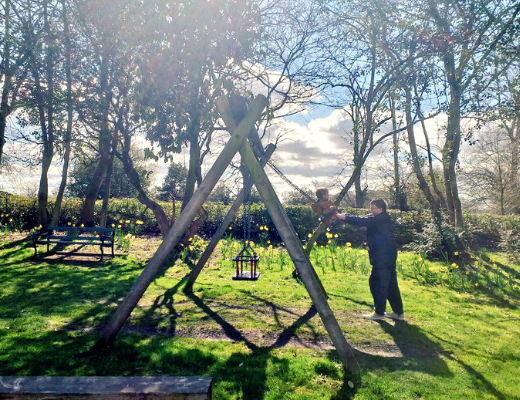 It could be learning about and responding to nature whilst taking a woodland walk or developing an understanding of weighing and measuring through some creative cookery. These are just a couple of examples though there are countless more. It’s lots of fun trying to come up with new ideas and approaches which my son enjoys. Pinterest and Instagram are both fantastic sources of inspiration for me and I’d highly recommend them as a starting place for generating your own ideas! This is a reminder to myself to open my eyes and to actively take the time to notice and seek inspiration from the world around me whilst encouraging my family to do the same. 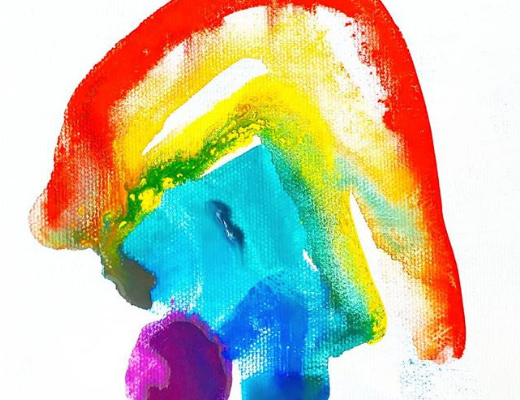 As an art teacher, I loved helping my students to gain that initial spark of inspiration which I could then assist them in developing into a fully realised idea or ideas. One thing I absolutely understood was how inspiration can come from anywhere and everywhere and how we all interpret the world around us in different ways. So, for our family, this could mean traveling to and exploring different places (albeit usually locally due to my illness). Additionally, there are lots of sources of inspiration to be found in our immediate environments, such as our home and garden. It’s also about remembering to keep our experiences meaningful. So less wasting our precious time on the unsatisfying and superficial stuff and more emphasis on connecting with things that will really nourish and enrich our lives. This could simply mean spending more quality time with the people we care about or learning to say no to the things we don’t. Since becoming chronically ill, I’m a lot more grateful than I ever was before. I can appreciate the little things every day (although some days this is still easier than others) and this has definitely made me a happier and more contented person over time. I feel it’s important to share this new-found skill with my family so that they can fully appreciate the benefits too. I’m sure most people would agree, that when it comes to creating a strong family bond, being there to love and support each other is pretty much essential, so it was really a no-brainer to include this in my list! It still doesn’t hurt to remember what’s at the heart of everything we do though. It’s really valuable to celebrate each other whenever we can too. If we don’t take the time to do this for each other, then who will? This obviously includes things like celebrating birthdays, events and family traditions but it’s equally important that we celebrate and ‘big up’ each other’s day-to-day achievements and the things which make us individuals. For example, we have an art wall in our house where we can display the art and crafts we do with our son or any he brings home from school and he loves seeing his creations on show! This is so important. If we neglect this as a family then everything else quickly unravels! My MS means that I get fatigued easily so taking on too much and rushing around, filling all the hours of the day with one activity after another just isn’t sustainable and what’s more, I end up paying for it big time! Sometimes I do feel guilty that we can’t do everything that we want to as a family and that I’m letting my son down but I’m also glad that my health has made us slow down and appreciate what it is to relax together. It means we can catch our breath and enjoy each other in a way that we couldn’t with lots of distractions. I’m all for slow parenting and taking pleasure in what each moment has to offer. We’re always looking for ways to simplify life and reduce our number of unnecessary, time consuming or energy-sapping commitments. 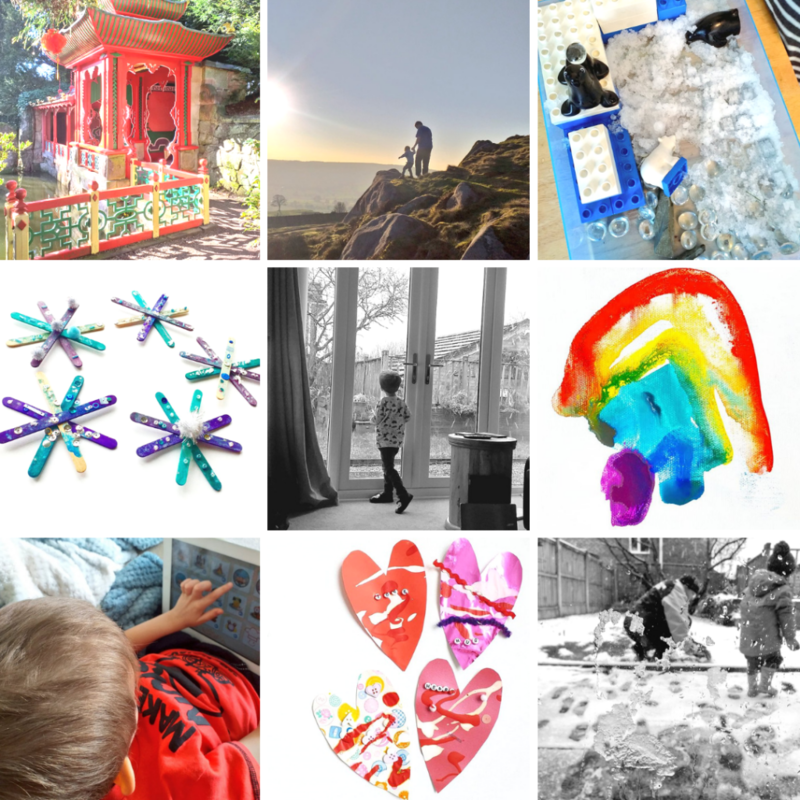 Quite often it’s about finding creative solutions or alternatives to some of the challenges that parenting with MS presents. For example, we currently pay for a cleaner to come into our home every fortnight to do a thorough clean. I wasn’t sure about it at first, it felt really lazy to have someone come in and clean our house, but the reality is that I’m ill and cleaning was using up all the energy I didn’t have! I love that I have more freedom to focus on the things I enjoy now and it has definitely made our family life easier. I’m not really sure where having another baby in a couple of months fits into ‘simplifying life’ but there you go! 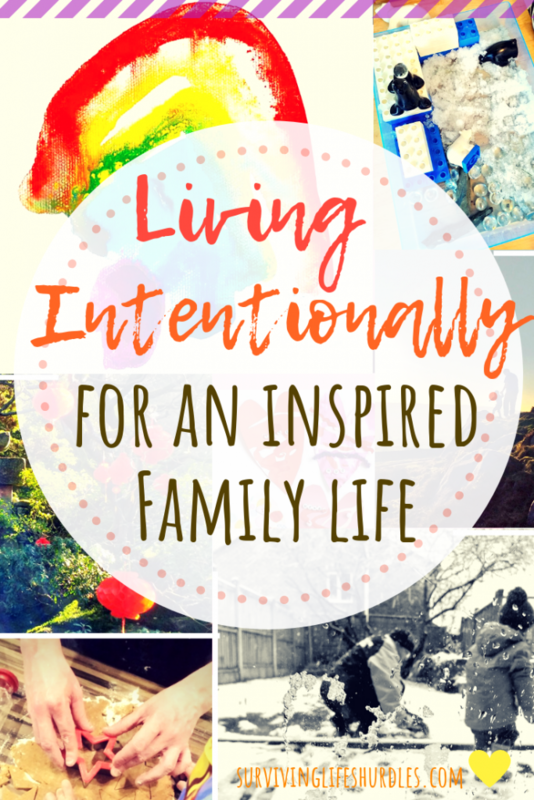 So, those are the ways we are trying to live intentionally to create an inspired family life which works for us and is full of creativity and fun! It’s without doubt still a work in progress though! I’m not sitting here pretending to have all the answers or claiming to have it all figured out. But at least we have a clearer sense of direction now and I feel really motivated too! I know there are going to be times as a family when our focus will shift from inspired to just about getting through the day. But that’s ok, life is never going to be 100% amazing all of the time and as I said, the aim isn’t to put pressure on myself or my family to be ‘perfect’. As long as have the groundwork in place we can keep coming back to it when we’re able. How about you, have you ever sat down and properly reflected on what your values are either individually or as a family? Or are you more like I was until recently and you have an idea in your head but nothing committed to paper (or screen) and properly considered? If it’s something you are yet to do, I would totally recommend it! 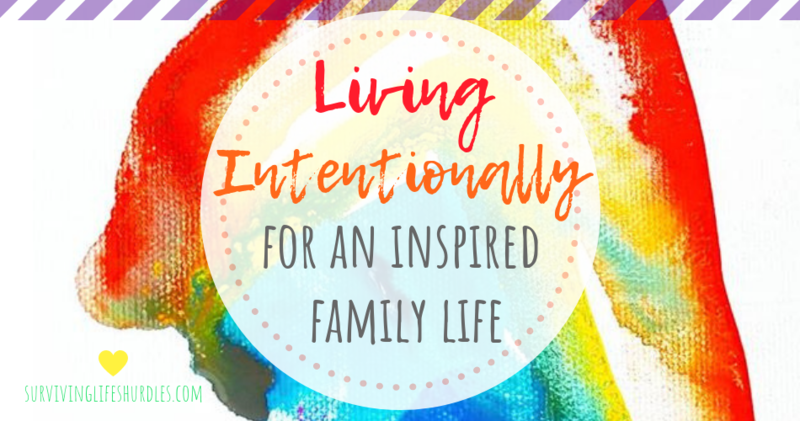 I’ll be sure to fill you in every now and then with our progress, exploring the ways we are living intentionally to create an inspired family life. Hopefully, I can share how our ideas develop and grow, even with a chronic illness and a new addition to the family! I love being inspired by how other families and chronic illness sufferers are living intentionally to enhance their lives so let me know if that sounds like you and I’ll make sure I’m following your story too! If you don’t already subscribe to my blog newsletter then please do. It’s probably the best way to be certain you’ll see my posts (and I’ll feel less like I’m just writing to entertain myself)! Wishing you lots of inspiration, creativity and fun! Well done! You are an inspiration and such a strong woman to share your battle with MS. I suffer from an invisible illness and my mom keeps telling me how SHE felt and “I know you don’t want to hear it..” but I put my foot down and told her I’m not going to live my life with what if, I’m going to keep doing what I love and when and if it comes to it–I’ll address it! Bravo! I was diagnosed with Bipolar l Disorder 20 years ago and put my family through plenty of heartache and pain. Thankfully, it’s under control now and, like you, I am embracing and living my life in a much more mindful way. We enjoy the simple things and make our own fun. I was an art teacher also and it helps to be able to think outside the box. This is an excellent message that encourages everyone to think about what they want life to be about. It is a beautiful post. We love family time and adventures too. Appreciating the little things is so important too. Your post really touched my heart. Can relate it with so well. After my chronic pain I have realised why I need to celebrate the smallest of my victories and to enjoy those little moments with family. I no longer take everything granted. I love your post. Sometimes I think that having a chronic health condition actually makes us step back to look at life more closely and appreciate the things that often go unnoticed. You’ve made some lovely suggestions to help people with this too. Thanks Emma, I know you’re following a similar journey too and you’re a real inspiration to me! You are so right that we need to evaluate the needs of our family and put aside the expectations of others. I love your suggestions for quality family time. Thanks for the reminder. This is such a wonderful perspective to take, Nat. Adjust and re-evaluate, and prioritise what’s important and who’s important in your life to make your moments count; celebrate your family, celebrate the small day to day achievements, and simplify life as much as possible to make things more manageable. With the new bub on the way I can see why all of this is probably at the forefront of your mind. Brilliant post, very uplifting and encouraging too!